Variety: Retailers to recall unsold Retaliation merchandise? When it rains, it pours– at least for Joe fans. At major retailers nationwide, something is missing from the toy aisles: “G.I. Joe: Retaliation” action figures. In their place, an empty space.With Paramount moving the actioner from June 29 to March 29, 2013, to give it more muscle at the box office with 3D, retailers are being asked to send back the line of Hasbro toys that were starting to appear on shelves. Some Walmart, Toys R Us and Target locations had started to stock the toys this week, although they weren’t supposed to make them available until next week. Those that did wanted to get a jump on demand, and some of the 47 items that would’ve been sold are expected to show up on eBay at inflated prices by the end of the weekend. 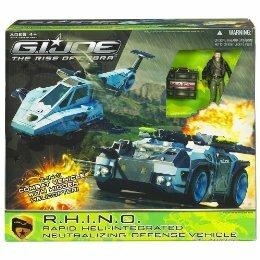 Target Exclusive “Rise of Cobra” RHINO available to order! According to the listing, it ships “within 24 hours” with “free shipping”. Want that exclusive 25A Rampage (aka “Heavy Metal”) figure? If so, it’s time to place an order! New TARGET Exclusive R.O.C. Mini Vehicles! Check out these new Four Sets with ARAH inspired vehicles. Pics of Possible Future ROC Exclusives have surfaced! Check out some pics of possible upcomming sets. Attack of the PIT Headquarters, Past and Present set and others.